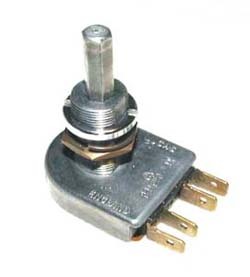 Like so many other MG owners, I discovered that my dashboard light dimmer switch wouldn't turn. Not on just one, but two of my MGBs. Since this item is about $70, I decided to see if I could fix it. According to my local British car parts house the Queen of England personally makes these for Lucas in her spare time. Since she is the Queen and can only make a few each month, the price has to be high. 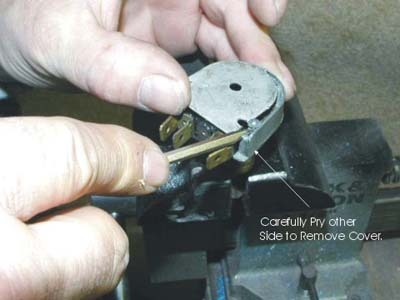 The basic technique of rebuilding the switch is easy but you must take your time. Required supplies would include a six pack of beer and a small screw. This is a factory sealed unit so at least one of the seals will have to be drilled out or filed off. 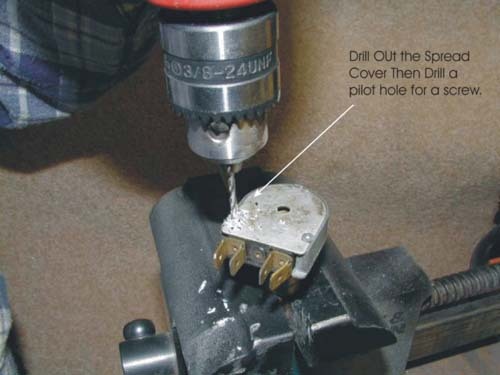 I use a 5/32 drill bit to cut off the spread top of the stud and while still in the vise I use 3/32 bit to make a screw hole to reattach the cover when I'm finished. While looking for a small screwdriver it would be a good time to get the first beer. Carefully pry the cover off, first near the stud you drilled the opposite side. 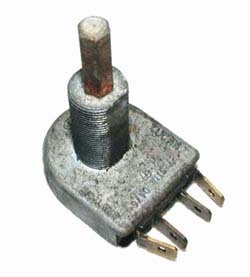 Again, carefully pull the cover off toward the terminal end of the switch. Leave the bent tab alone. If you try to pull it up and later bend it back it will only break off. With the cover off you will see most of how the switch works. There are no springs or other tricky fits. At this time stop and look at what you have. Now would be a good time to get another beer and just stare at the switch. If you are finished with your beer and you have noted how everything fits together. Get another beer and stare at it some more. 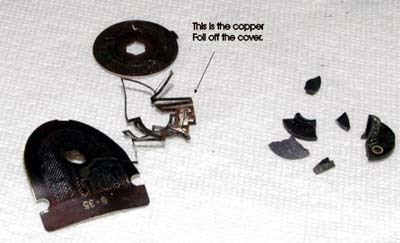 If any of the traces of circuitry on either the cover or circuit disk are coming loose, try to carefully push them back into position. 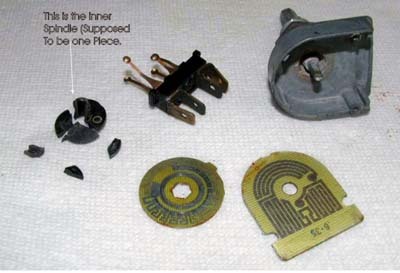 Some of the traces can be torn or missing and the switch may still mostly work. Substantial amounts of traces missing and the switch will not function and the lights on the dash may not work. Note 1: If this is the case, see if you can find another used unit and combine the parts from both. I was able to obtain a dozen from my local MG place that were in a junk pile for a couple bucks each. If all the parts seem in pretty good shape you are in luck. The thing will probably work when you put it back together. Often you will see something like the broken spindle shafts and loose traces shown in this picture. Since I cannot stand greasy, rusty parts at this point I usually polish the outside of the case with a wire brush on a bench grinder. Now put a small amount of oil on the knob end of the main shaft. 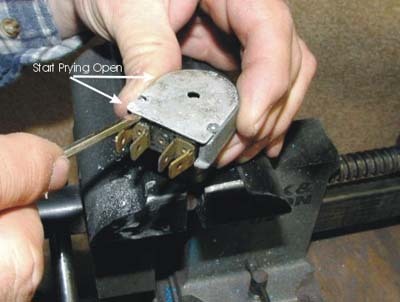 Get a 1/4" wrench or nut driver and turn the main shaft until it moves freely. On stubborn units I have used my cordless drill to spin the shaft till it moves freely. The more you spin the main shaft the looser it will get. Use your judgement on how freely you want this to move and proceed accordingly. Carefully clean any old grease, bits of metal from drilling, and trash out of the inside of the unit. Once again don't try to do anything to the electric traces. They are too fragile to mess with. 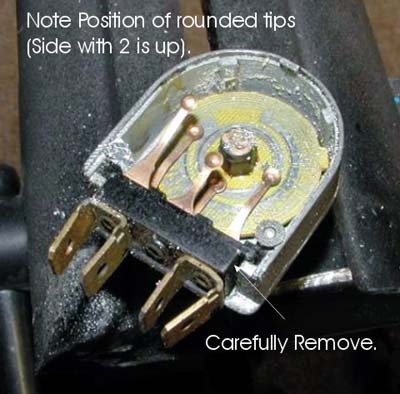 If the five finger buttons on the connector block are dirty or discolored; you can lightly polish the tips. Do not use sandpaper (it will leave scratches that will rub off the electric traces). Now is a good time for the next beer. 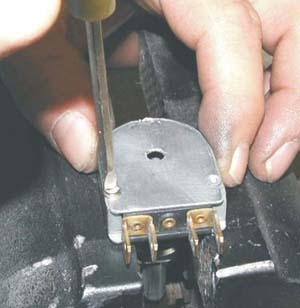 If you can still focus your eyes and hold a small screwdriver you can proceed with the next step. Reassemble the thing. Slowly slide the cover back into place and put a small screw into the hole you made previously. Hook the unit back to the wiring harness and check function before reinstalling into the dash. If it works right and you can still walk now would be a good time to finish off that six pack. You can put the switch back in the dash tomorrow. Comments on "Fixing the Panel Dimmer"
I'll put this to use. Great article. 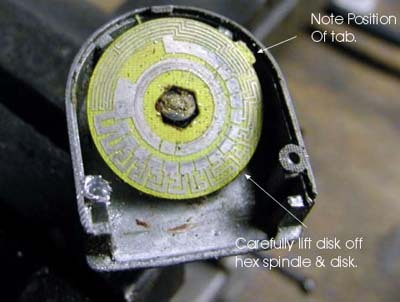 I am working on restoring the Fan switch on my 74 B, I am hoping to do the same nice quality article for it. My switch (1973 B assembled in Abingdon) ) was not working from when I purchased it in March this year. All the gauge lights worked. When I pulled facia recently (thanks to Kim de Bourbon article by the way) I pulled it out and took it apart - after all I couldn't make it any worse! Its different from Dwains but I just needed to lift three metal tabs to expose the internal workings. I'm not technically minded but I just cleaned the contacts - one moves against the other - and I thought that's all I could do then reassembled. Well when I got the facia back in - and that's another story - I switched on the lights and nothing! Panic gripped my MG heart and in desperation I thought what now? I then thought, ''try the dimmer'' which I did and the dash lit up like a Christmas tree! Another example of the MG taking you to the depths of despair but then rewards you for all the love you put into it. What a car!